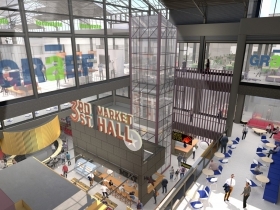 Last week we reported on a planned revamp of Grand Avenue Mall, which will include a brand-new food hall. 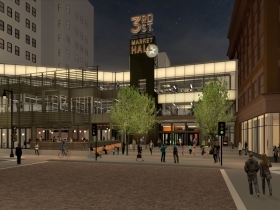 Yes, the old Shops of Grand Avenue will be transformed into “The Avenue,” which will include The 3rd Street Market Hall, one of many planned changes for the old mall, such as new offices and other new tenants. 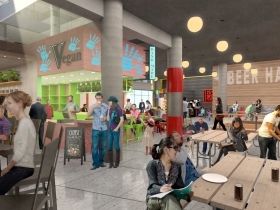 Led by Omar Shaikh of SURG Restaurant Group, the new food hall will feature 20 vendors total, with a goal of creating one of the top food halls in America once complete. 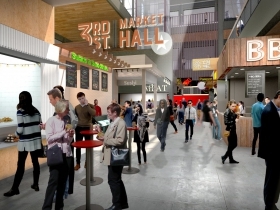 The food hall is intended to ultimately include 20 vendors, and Shaikh says letters of intent have been signed for 75 percent of the spaces. 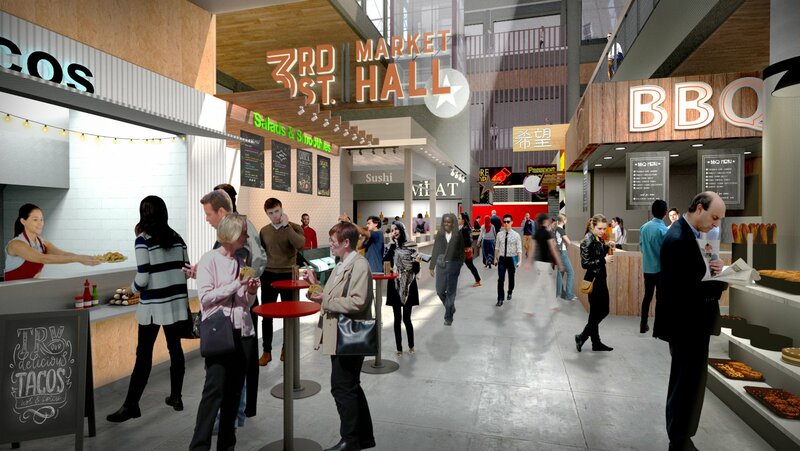 Vendors announced Thursday for the food hall include Stone Creek Coffee, chef Yosub Yoon‘s Korean barbecue restaurant Char’d, Milk Can, a new burger and custard place from chef Kurt Fogle, Donut Monster by chef Jackie Woods and Sara Woods, Waterford Wine & Spirits and Funky Fresh Spring Rolls. A beer hall, with final operators being vetted according to Shaikh, will operate in the former Applebee’s space with an indoor-outdoor design. The Shops of Grand Avenue mall will be closing temporarily towards the beginning of 2019 in order to open the path for further construction and renovations to complete the proposed plans for The Avenue. 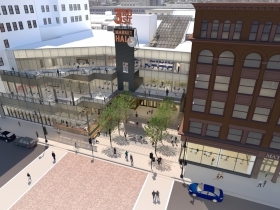 The 3rd Street Market Hall is projected to open in late 2019. The new Uncle Wolfie’s Breakfast Tavern is slated to open its doors next Monday, December 17th. Located in the Brewers Hill neighborhood at 234 E. Vine St., the new restaurant and bar is owned by husband and wife Wolfgang and Whitney Schaefer, who bought the old building for the venue which has historic ties to the Miller Brewing Company. 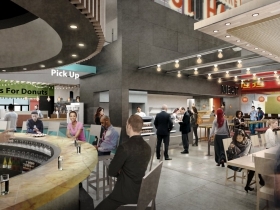 The restaurant will offer a mix of classic and modern takes on breakfast and lunch items, as well as a bar featuring a variety of cocktails. Folks will find standards like Johnny cakes with whipped butter and syrup, steak and eggs with tavern potatoes and a classic eggs Benedict along with creative takes on classics like peanut butter and jelly stuffed French toast and a sweet potato chorizo omelet. Items are priced between $7 and 12. The bar will offer bottled and canned beer, a short list of wine and a variety of creative cocktails – from bloody marys to toddies made with jasmine tea – along with full coffee service. After the 17th, Uncle Wolfie’s Breakfast Tavern will operate regularly from 7:00 a.m. to 3:00 p.m. Mondays through Fridays and 8:00 a.m. to 3:00 p.m. Saturdays and Sundays. Owners of the restaurant Mae Velma’s Corned Beef on Milwaukee’s West Side have plans to open another restaurant nearby. Husband and wife Tyron and Tonya Smith have been operating their corned beef restaurant at 4115 N. 76th St. for about one year, and have been looking into opening a new venue at a vacant kitchen space within a nearby gas station at 7609 W. Capitol Dr. Although the new restaurant, to be called Smith Brothers Catfish Station, is catfish-centered, the main theme will be Southern-style fried items with alternative options like Italian beef and Philly cheesesteaks. All of the dishes will be prepared made-to-order. At his first restaurant, Smith said, the staff learned customers are willing to wait for their meals, even in a quick-service environment. The restaurant should open later this month according to Smith, though there is no specific date. Once open, the initial hours of operation will be Mondays through Saturdays from 11:00 a.m. to 10:00 p.m. Smith has plans to eventually extend the hours to 8:00 a.m. to 2:00 a.m. daily. A new pub named Drink Wisconsinbly is planned for the prospective Entertainment Block right next to the Fiserv Forum, home of the Milwaukee Bucks. Located at 320 W. Highland Ave., the new pub and merchandise shop is the third confirmed tenant for the new Entertainment Block, alongside Good City Brewing and the Denver-based Punch Bowl Social. The pub already has some presence inside the arena, as well as a location currently in Walker’s Point at 135 E. National Ave. that will be closing by the end of the year. The Entertainment Block near the arena, which will include more tenants yet to be announced, is slated to open by Spring 2019. The Lowlands Group announced last week the temporary closing of Cafe Centraal in Bay View for scheduled renovations. Renovations will begin on January 2nd and are projected to finish by early February. Though details are somewhat scanty on the revamp, an “evolution of the existing Central concept” is promised according to a press release from the Lowlands Group. Until the renovations begin, Cafe Centraal will operate regularly through New Year’s Day, closing only for Christmas Day.